Applied Computing Graduate and Successful Tech Entrepreneur Elliot Thomas (right) returned to the School today to share what he has learned with our students. Elliot (Winner of Start-Up Weekend Swansea) secured funding and support from several backers and has started several Tech Companies since graduating Fuzmo (a Pet Picture sharing App), Skippr (an Instagram Marketing App) and Clockers (a Cloud Software Development Talent Service). The students thoroughly enjoyed Elliot’s talk and we would like to thank Elliot for returning to the School and look forward to welcoming him back in the future :-). Thank you Elliot – Good luck with your new ventures and we look forward to seeing you again soon. A delegation from Zambia visited Swansea’s School of Applied Computing last week – please see some of the photos below. The School is now looking to develop further links in the future with the possibility of student project work and the teaching of Zambian school teachers. The delegation also shared some of their innovative teaching methods for Teaching Computing with little resources demonstrating very good practice within the field of frugal innovation. Representatives from Swansea’s School of Applied Computing (Arya, Carlene and Archie) recently visited the MATLAB EXPO in Silverstone. MATLAB (matrix laboratory) is a multi-paradigm numerical computing environment and fourth-generation programming language that allows matrix manipulations, plotting of functions and data, implementation of algorithms, creation of user interfaces and is primarily used for numerical computing. I found the event very informative and rewarding, especially considering it was free to attend. The keynote was particularly good as it showed how Matlab is used across a diverse range of industries and the types of system it’s been involved with the development of, perhaps most notably the New Horizons Flight Software. The technical talks and demonstrations were also great; they also weren’t too long so it was easy to stay focused. Several sessions will be beneficial to my research and I’d strongly recommend the event to anyone in the faculty. – Archie. For more information about the event please click-here. And for event proceedings please click-here. Q. What was your HE course? A: Virgin Media – Data Services, owned by Liberty Global – the largest telecommunications company in the world. A: Independent working/research and also the broad range of industry specific knowledge. A: Every day is different. Some days I’ll be in my local office working furthering my HE studies towards certification [Cisco certifications: CCNA+CCNP+CCNA Specialisation+CCNP Specialisation], alongside providing standardised connection packages to small-medium businesses and assisting on larger project based work for bespoke networking solutions. Other days I’ll be at a clients site and some might even be spent in hotels going segwaying, raft building or even just days out with the other Virgin Media graduates. A: Working with some awesome and expensive technology, which changes from day to day. Also the responsibility I’ve been giving from the start, Virgin Media put a lot of trust in their employees which creates a really nice environment to work in. A: Make University a friendly competition; it’ll help both you and other people on your course at the end of it. 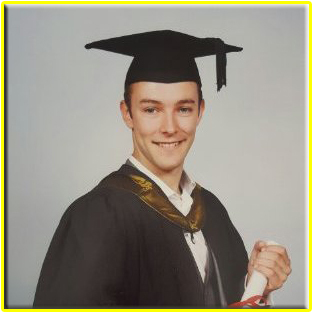 > For more information about Graduate positions at Virgin please click-here. 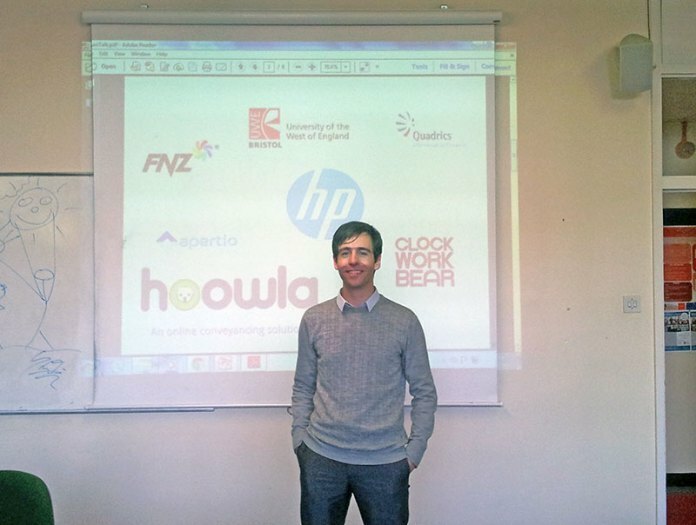 Adam Curtis, CEO of Hoowla & Software Development Agency ‘ClockWorkBear’ and Co-founder of TECHHUB Swansea visited UWTSD Swansea’s School of Applied Computing today to talk to Enterprise & Innovation students about Careers in Computing and Tech Start-Up opportunities. The Student Group thoroughly enjoyed Adam’s talk and look forward to seeing him again at Start-Up Weekend Swansea next month.